My life flashed before my eyes as I looked at this picture. Memories of my childhood… Memories of the Sound of Music, a classic, as we watched having no clue the impact it would have on our future. Now years later all grown up, its a reminder of years gone by and our own youth that no longer exists… To see the pictures of yesterday and today are bitter sweet… The reminder of an era for me, brings back so many wonderful memories… A time that is truly missed! As we all are present to today, I am so very grateful for those precious memories that are still so present in my life. 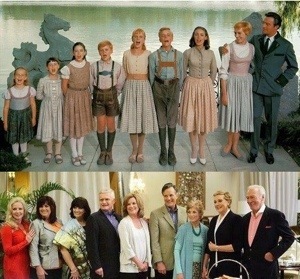 The hills are still alive with the sound of music!